Soul Kinda Wonderful's next gig at the Livestock Festival in Enfield (29th July) is set to be even more special as the band celebrate another win at the National Music Tribute Awards. This outstanding band were recognised with the Official Number 1 Music Tribute to The Drifters. Soul Kinda Wonderful is a lively, fun-loving music act that was formed more than 10 years ago, based in Leicester but performing for fans and celebrity events worldwide. The group enjoy performing and celebrating music of the golden era, specifically the genres of soul and Motown, and have sung some of the industry’s greats as a result (including popular classics by artists such as Ben E King, The Temptations, The Drifters and The Four Tops). Having achieved status as this winner for the third time (Soul Kinda Wonderful was also presented with this accolade in 2013 and 2016) the members are delighted to be multi-award winners and retain their title as the UK’s official Number 1 music tribute to the Legendary Drifters. Soul Kinda Wonderful were presented with the prize during a prestigious award ceremony in early July, where they were identified as a worthy winner for their continued enthusiasm and commitment to their industry. As well as their award-winning tribute act, the members also perform their own songs, which are penned by the established and widely respected song writer Richie Sampson, who has worked with the likes of former Legendary Drifters Ray Lewis, Billy Lewis, Roy G Hemmings, Peter Lamar and Butch Leake. The combination of distinct vocals and well-executed dance moves captures the true essence of Soul and Motown magic, and Richie and his team ensure to delight crowds with much-loved songs that never fail to get the audience moving. They cover catchy hits such as ‘Saturday Night At The Movies’, ‘Under The Boardwalk’, ‘My Girl’, ‘Stand By Me’, ‘Save The Last Dance For Me’, ‘I Can’t Help Myself’, ‘Build Me Up Buttercup’ and ‘Come On Over To My Place’. Duly regarded for their star quality and stage presence, Soul Kinda Wonderful are in high demand and have, as a result, performed all over the world at many different events. They have appeared in front of royalty, sang aboard luxury cruises and been cheered on by celebrities, namely Sir Alex Ferguson, David Beckham, Rio Ferdinand, Coleen Nolan, Richard Branson and Tom Cruise (at the film festival in Dubai). If you love soul and Motown music, or even if you simply like to enjoy a song and a dance, you really must experience the wonder of Soul Kinda Wonderful. Any event is sure to be a success with the involvement of this incredibly professional and highly recommended class act. 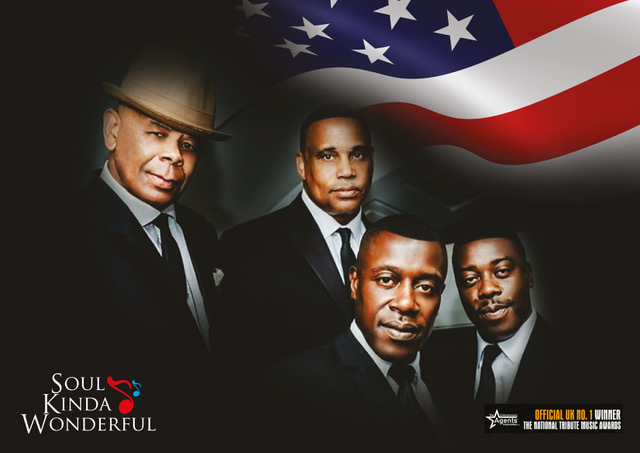 SOUL KINDA WONDERFUL (Richie Sampson, Roy Bailey, Victor Alexander and Paul Anthony) celebrates the music of the golden era of Soul and Motown, along with original songs written by their own songwriter Richie Sampson (who is also a science teacher when he's not writing or performing). Formed over a decade ago the group brings the music and songs of a splendid era back to life. Favourites include Ben E King, The Temptations, The Drifters and The Four Tops plus many more, and the group take their name the from the classic Drifters hit ‘Some Kind of Wonderful’. In the 1990s, Paul, Roy and Richie were in a group with former member of the legendary Drifters, Ray Lewis. Victor Alexander was formerly a percussionist for Mark Morrison. Richie Sampson is also currently on a nationwide theatre tour with the legendary Three Degrees. SOUL KINDA WONDERFUL celebrates the music of the golden era of Soul and Motown, along with original songs written by the quartet's songwriter Richie Sampson.